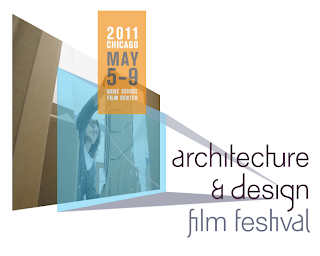 We're still finishing up the May 2011 Calendar of Chicago Architectural Events, but we're already up to over sixty events. 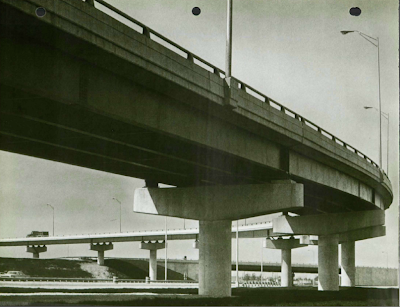 The first blockbuster is Harry Weese Reconsidered, an all-day symposium at the Chicago Architecture Foundation, Saturday, May 14th, which will include Ben Weese, Laurence Booth, Robert Bruegmann, Alison Fisher, Jack Hatray and Annie Pedret, among other luminaries. "Former employees and clients, family members, historians, and critics will gather to share personal anecdotes and put Weese's legacy in historical context." 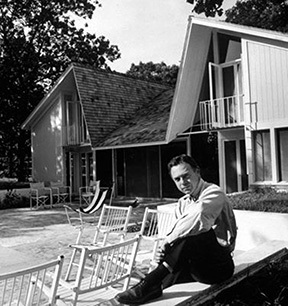 In conjunction with the symposium, on Sunday, May 15th, there will also be a one-time-only five-hour bus tour with Robert Bruegmann, author of The Architecture of Harry Weese, which will highlight Weese’s buildings and examples of his preservation efforts in Chicago. The tour will focus on projects in Hyde Park, downtown Chicago, and the Old Town neighborhood, and will include special access to privately-owned, Weese-designed buildings in Chicago. $55.00 for the general public, $45.00 CAF members. Information and registration for both of these remarkable events here. The first weekend in May will see the Architecture and Design Film Festival. 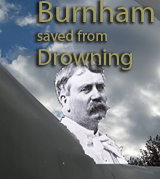 Recent documentaries on Daniel Burnham and Louis Sulivan didn't make the cut, but there's a cornucopia of 39 films, from 2 minutes to 93 minutes in length, organized into 15 programs, most at the Gene Siskel, but with a number also repeated at the Screening room at the Wit Hotel. Film subjects include Norman Foster, Milton Glaser, Phyllis Bronfman Lambert, Samuel Mockbee, Vincent Scully, Julius Shulman, Aaron Betsky, and Jan Kaplicky, among many others. You can check out the full roster and schedule of films here. In conjunction with the festival, there will also be a series of free panel discussions at the Siskel, beginning Friday, May 6th's Documenting Architecture, with Iker Gil, Bjarke Ingels, Rick Valicenti and Zoe Ryan, with four more panels following through May 8th, including among the many participants Edward Lifson, Ultan Guifolyle, Geoffrey Baer, Zurich Esposito, Obi Nwazota, Red Mike, Lee Bey and Jonathan Rosenbaum. On Saturday, May 7th, there'll be a reading June Finer's play The Glass House, on the creation of Farnsworth House and the conflicts between its architect, Mies van der Rohe, and Edith Farnsworth, directed by Evan Bergman, and featuring Harris Yulin, Janet Zarish, Chris Burns, Gina Nagy, to be followed by a Q&A session with architect Dirk Lohan, Mies's grandson. 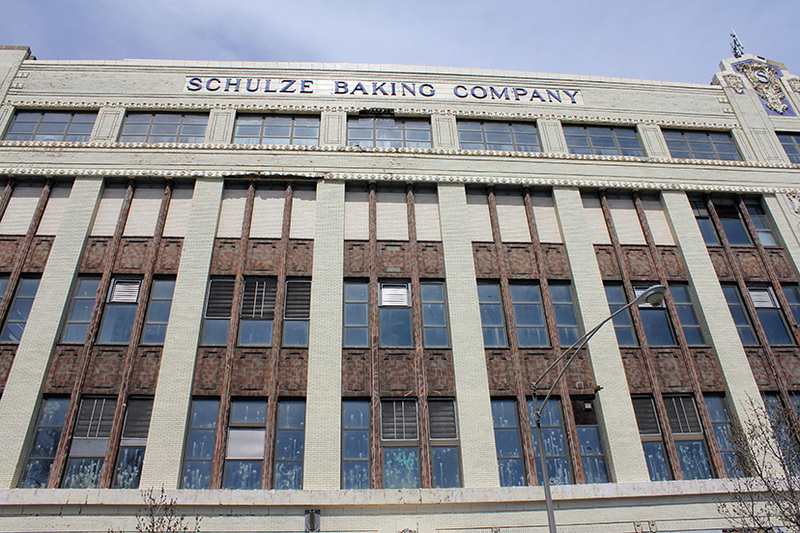 The Schulze Baking Company Building at Wabash and Garfield, designed by architect John Ahlschlager, was completed in 1914. 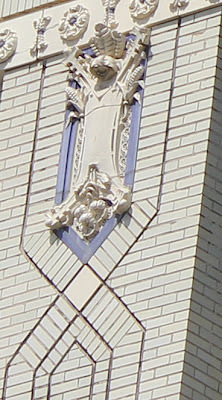 It was added to the National Register of Historic Places in 1982, but is not an designated Chicago landmark. 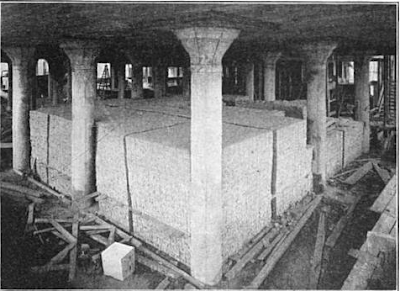 The five-story, reinforced concrete structure, 298 feet by 160, has columns on 17' 6" centers, and floor slabs up to 14 inches thick, designed to support loads to 300 pounds per square inch, but actually tested to support more than twice that weight, as illustrated in the photograph below. The building's distinctive for its openness - over 700 windows . . .
. . . but much more so for its light-colored terra-cotta facades and rich "Sullivanesque" ornament. 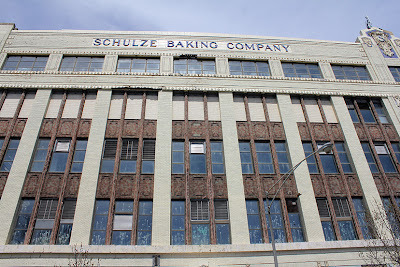 Schulze Baking eventually moved out - as Schulze and Burch, the company now has a large plant on 35th street - and for a time the building was a bakery for Butternut Bread. Now, it's empty. 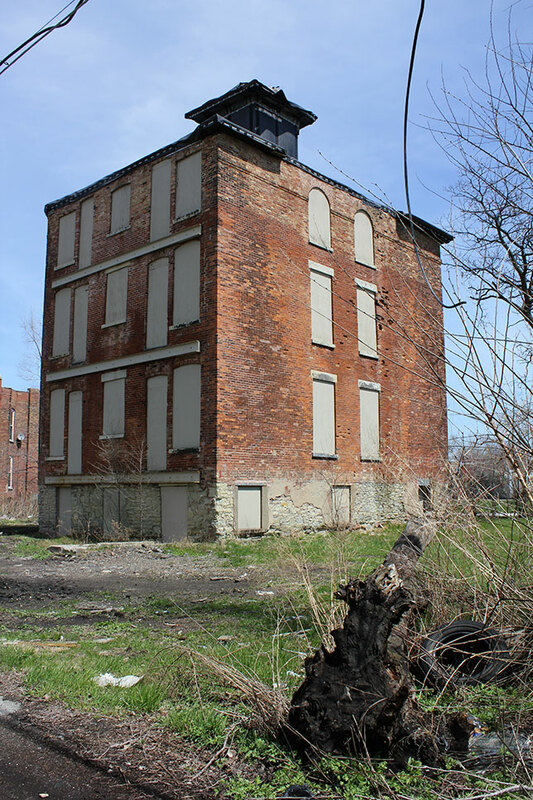 In 2009, a proposal was announced for Cleveland's Ferchill Group to acquire the property and renovate it as 88 affordable housing units, but the company's website currently makes no mention of the project. 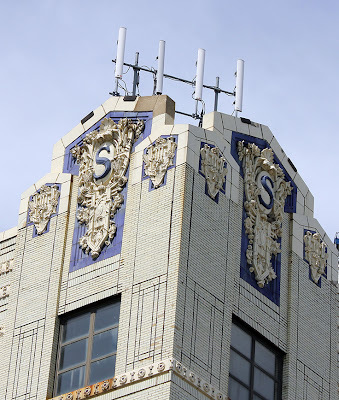 Right now, aging scaffolding hems the building to protect pedestrians from crumbling terra cotta, and the proud structure's highest current use appears to be as a cell phone tower. Our Raber (House) Has Tender Grapes; Can a vineyard estate save an abandoned landmark? How do you get from here . . .
. . . to here? . . . 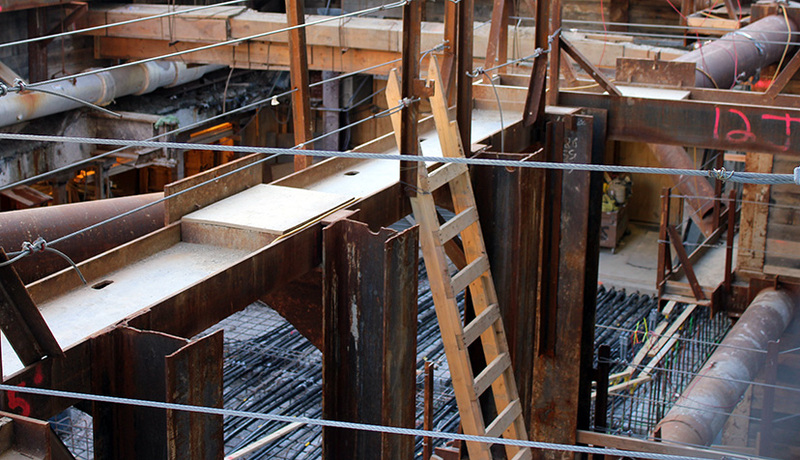 The short answer: mix in a place and a building, and shake for 140 years. The longer version? 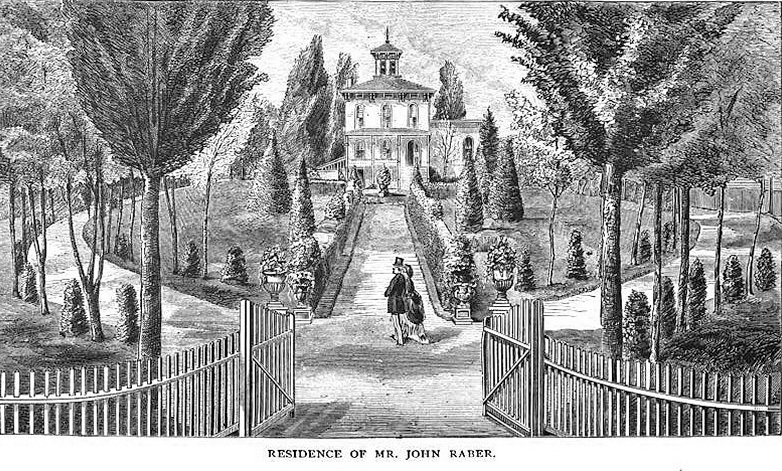 This is the John Raber house. 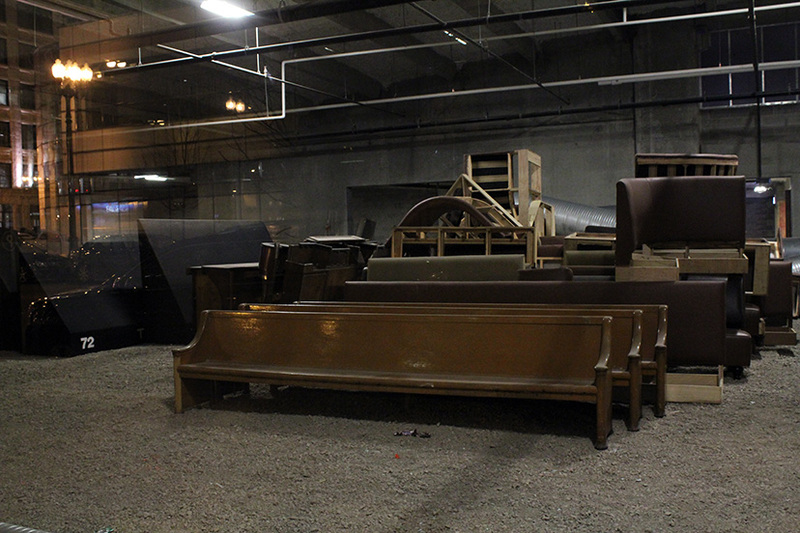 City-owned, it was made an official landmark in 1996, yet it stands empty and hermetically sealed. 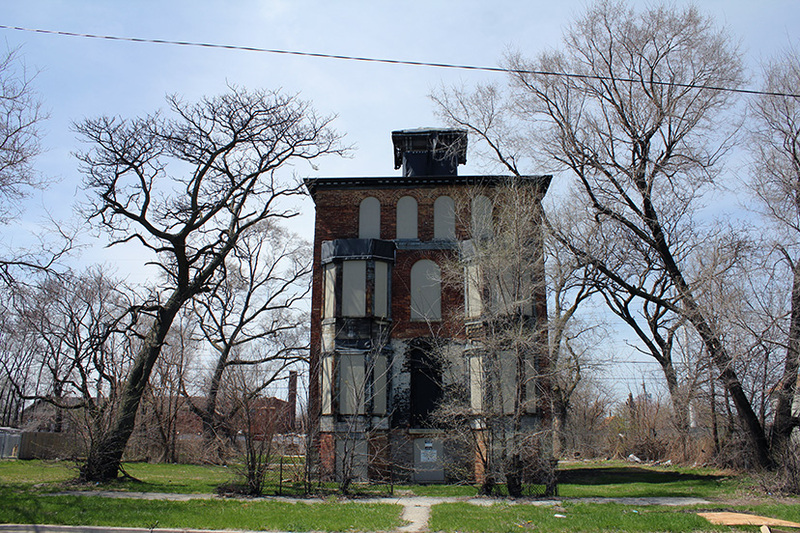 It's in the news right now because, as reported by Melissa Harris in the Chicago Tribune, rehabber and preservationist William Lavicka is trying to turn the long abandoned Raber house and its environs into a urban vineyard. The article describes the Raber as "a boarded-up Washington Park mansion", which is definitely a tonier address, but in reality it's in the northeast corner of Englewood, and its history dovetails with the history of that neighborhood for most of its 170 years. Seven miles south of the Loop, the land on which the Raber house stands began as a swampy oak forest, situated on a ridge and home to the Mascoutin Indians. In 1840, the land was officially designated as habitable by the U.S. Government Land Office. A contemporary history enthused over the water supply: "coming through heavy gravel deposits, it is of a very pure character, and is never failing." A settler named Wilcox claimed land along a ridge that would become Vincennes Avenue. The Mascoutins moved on. In 1852, the railroad came to the area, with the Rock Island establishing a depot at 63rd and LaSalle streets. 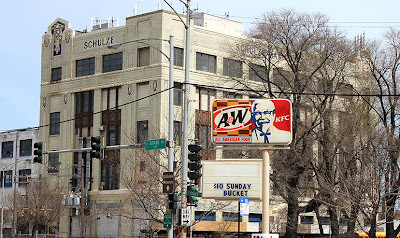 Soon so many lines crossed through the district that it came to be known as Chicago Junction, with no fewer than three depots. In 1868, local merchant Henry B. Lewis successfully lobbied to change the name to Englewood Junction to improve the suburb's image. That same year, real estate developer L.W. 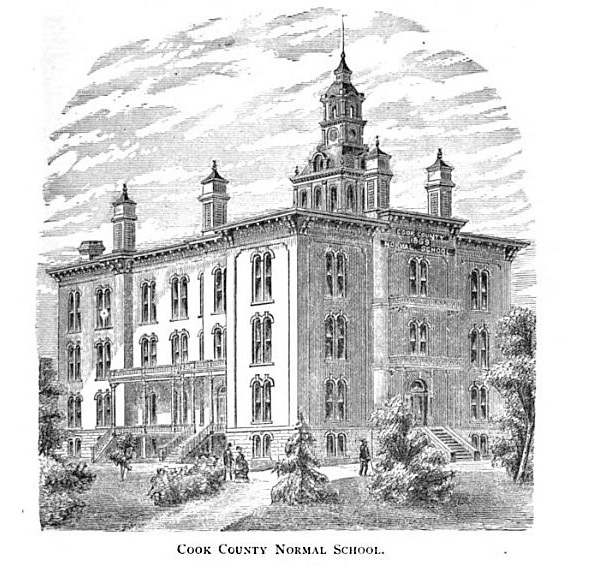 Beck donated 10 acres around 67th and Halsted for the construction of the Cook County Normal School, precursor to today's Chicago State University, constructed at a cost of $120,000 within a 20 acre park. 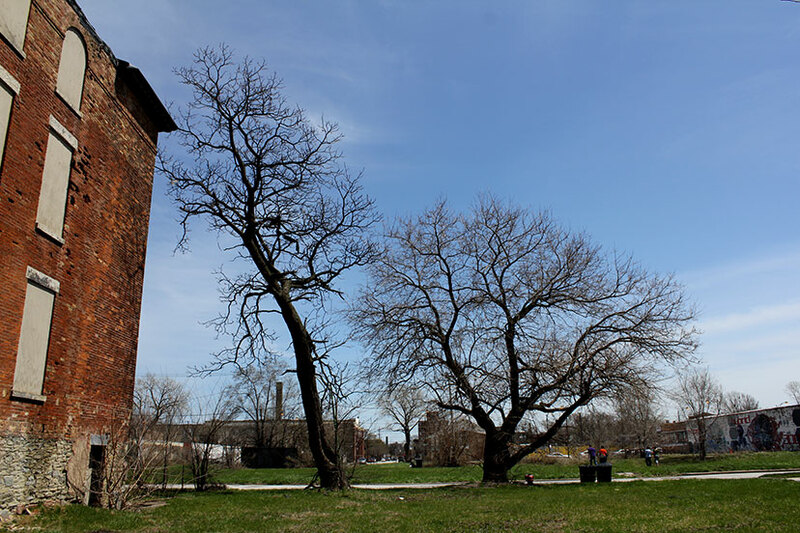 According to A Short History of Englewood, a newly formed Englewood Business Men's Association began razing the oak forest and replacing it with paved roads lined by maples and elms. Except for a few mansions on Wentworth, most homes were modest. Then came the Great Fire of 1871, and suburbs like Englewood drew wealthy buyers eager to escape the perils of the city. Described by historian Bessie Louise Pierce as a saloon keeper, John Raber was a mainstay in Chicago Republican politics, alderman of the 5th ward, and an unsuccessful candidate for city treasurer in 1881. 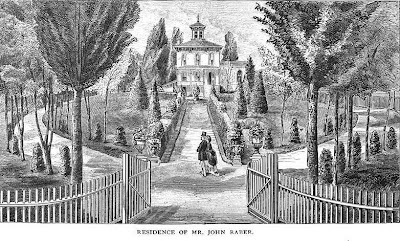 Raber had purchased a house and an adjoining thirteen acres for $18,750 in 1862, sold off seven, and keep six for himself that stretched all the way to State Street. Just seven years later, the value of his property had increased to $75,000. And it was here in 1870 that Raber built the Italianate-style house, with later additions by architect Thomas Wing, that still stands today. The house stands in the center of handsomely arranged grounds . . . and although the building itself is not remarkable for its beauty, its surroundings are such as to render the general view very inviting. Within the enclosure are finely graveled walks and drives, bordered with beautiful arbor vitae hedges. 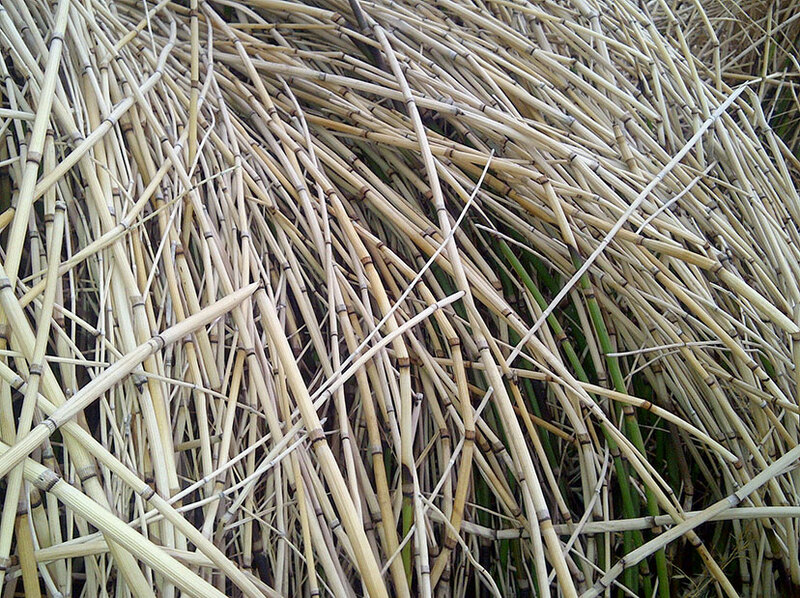 Miniature lakes, filled with gold-fishes, and other pleasing features are to be met at every hand. Raber's idyll was not to last. Englewood began to absorb workers from the stockyards to the north, and subdivision spread. 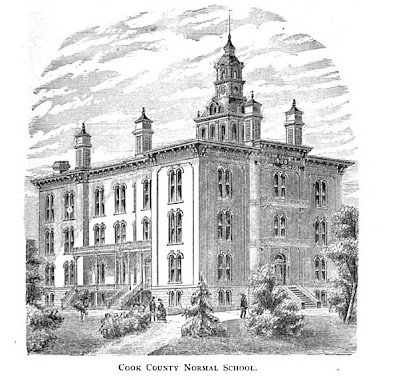 Around the Normal School, 40 acres became eight blocks of 24 lots, which sold for $8.00 per front foot in 1869, $12 in 1871, and $18 to $20 in 1972. Over 15,000 ornamental trees were planted along the streets. By 1874, the population was over 3,000 people. Englewood was annexed to the City of Chicago in 1889, and another construction boom followed around the time of the 1893 World's Columbian Exposition. After apartment buildings began to take over major streets, the population soared to 86,000 people by 1920. In the 1880's, Englewood's had a black population of only about 26 people, mostly railroad and domestic workers. 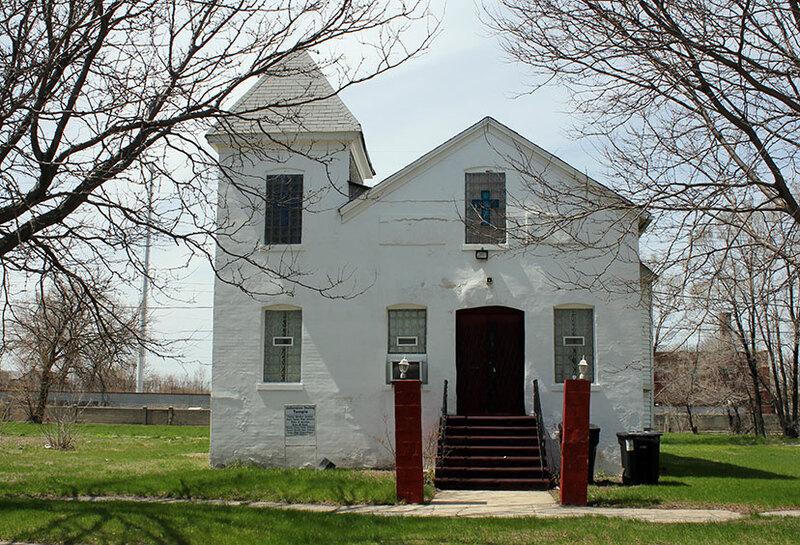 Through the ensuing decades, restrictive covenants kept blacks out of Englewood. In 1949 when eight Afro-Americans were among the guests at a reception for union members at a house on Peoria Street, about a mile west of the Raber, two days of rioting following. 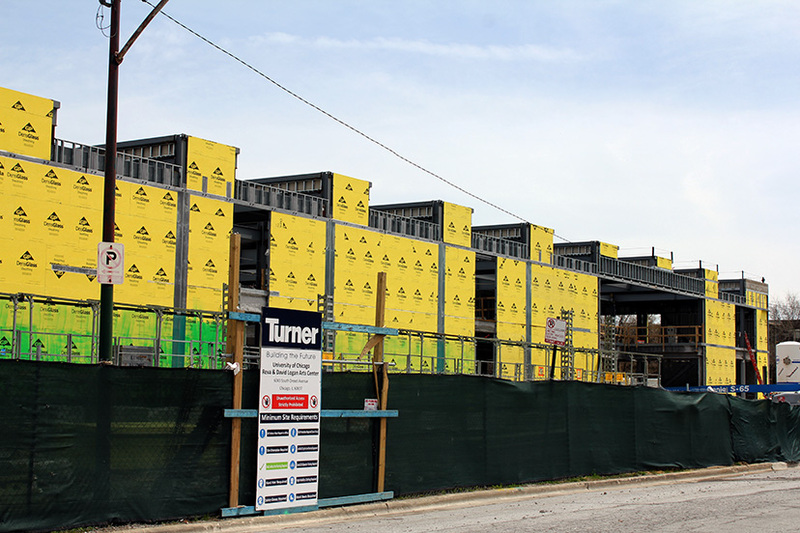 With the coming of the expressways, white flight hit Englewood in a big way. In 1940, blacks were just 2% of the population, by 1950, 69% Afro-American; by 1970, 96%. In 1960, Englewood's aging, overcrowded structures were home to a peak population of 97,000 people. Judging by the rusting mailbox, the Raber was divided up into six separate units. And then it all imploded. Abandonment became pandemic. Buildings either fell down, by neglect, or burned down, out of boredom and anger. 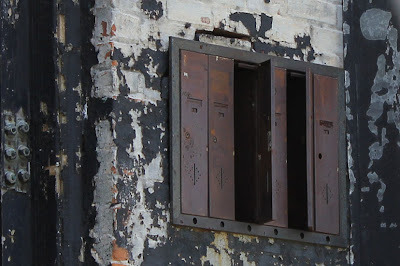 Vacant buildings numbered into the thousands, and by the 2010 census, population had fallen to about 30,000 people, a 25% decline from just a decade before. The area around the Raber House seems to be regressing back towards the days before settlement. 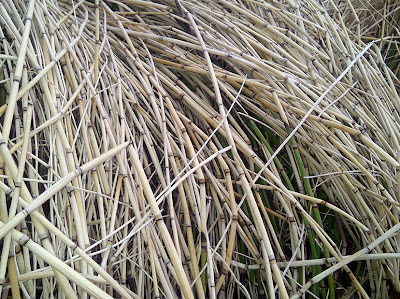 Instead of a swamp, surviving homes stand adrift in an ocean of vacant lots, improvised landfills strewn with debris. Walkways branch off from the sidewalk, leading nowhere, to clumps of dirt and the rubble of crumbling foundations. Still, the homes that remain mostly seem well maintained, a stubborn refusal to be brought down. Just down the street from the Raber, this charming church endures. 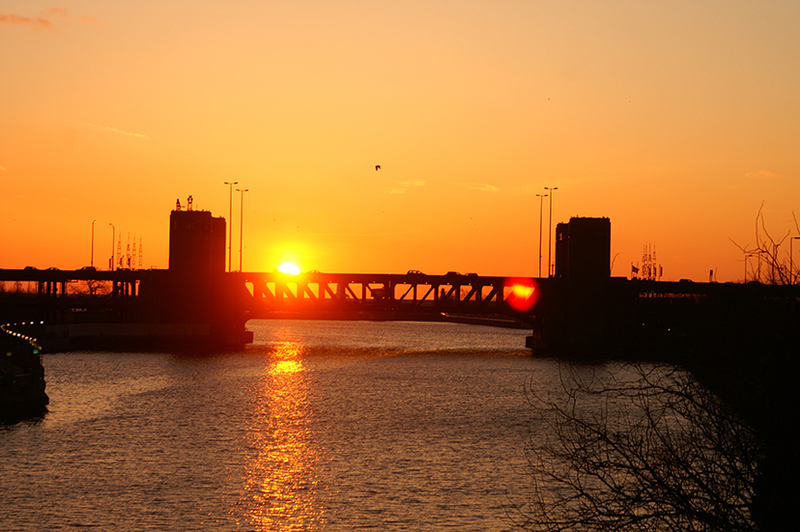 Chicago is not Detroit, but the last census showed the city losing 200,000 people since 2000. Many of its outlying neighborhoods are depopulating. How do you deal with evaporating density? William Lavicka is looking to restore the Raber House and the area around it as a grand estate. He's trying to get the city - which owns it all - to sell him the Raber House, plus up to 50 lots for a buck a piece, and kick in street infrastructure and other subsidies not defined in Melissa Harris's report. In return, Lavicka wants to establish a 5,000 vine vineyard. Soil samples are being taken to make sure it's not contaminated by industrial toxins, as focus groups have determined that "Chicago Reisling - now with added lead!" would be a substandard selling point. Could a urban vineyard be the kind of beacon project that reasserts a neighborhood's identity and revives its fortunes? There's a seductive bit of urban romance in all this. That 1870's rendering at the top of this post? Was it in Chicago, or Over the Rainbow? Can we really reclaim time? And what time should that be? Should we ask the Mascoutins? Currently clad in bright yellow gypsum sheathing, the long, lower expanse of the 170,000 square-foot project stretching almost down to 61st looks like the beginnings of a Walmart superstore, but the two-story space behind it will eventually host a wide range of functions from studios, classrooms, shop, a gallery, and no less than three auditoriums, including a 450-seat performance hall at the southeast end of the building. 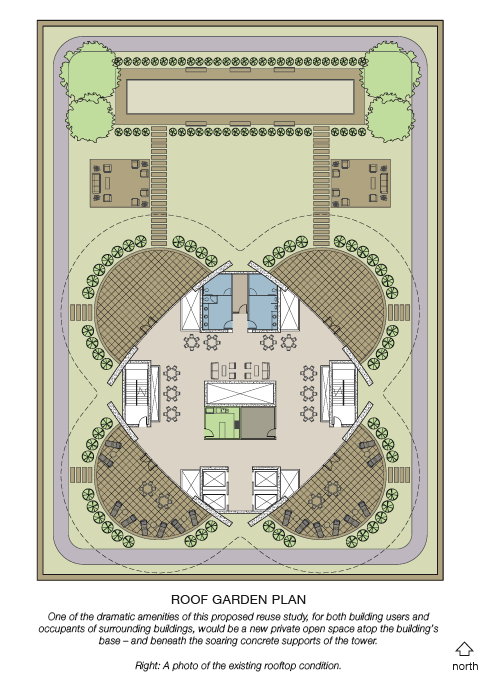 Landscaped courtyards will buffer the structure from the landmark Lorado Taft home and studio, just to the east, with another lawn, even larger than the performance hall's footprint, separating that auditorium from the Ingleside Avenue. 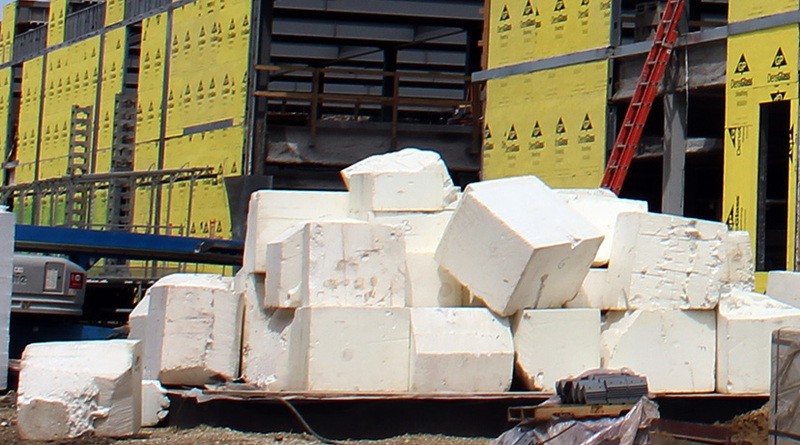 Huge blocks of feta cheese are being assembled for further soundproofing. 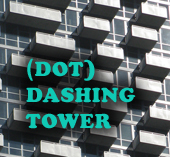 The 11-story tower, itself, amidst numerous classrooms and practice rooms, will host even more auditoria: a screening room, performance spaces - one for dance, one for theater - and what promises to be a spectacular "performance penthouse" at the top, with the building cracking open to the northwest like a giant-yoked, rectangular egg to create a rooftop terrace. Schuler Shook are the theatre consultants; with Kirkegaard (the audio people, not the philosopher - at the U of C, you can never be sure) handling the acoustics. 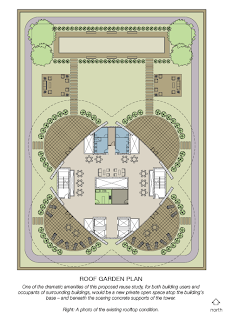 Severud Associates are the structural engineers, Hargreaves Associates the landscape architect, Holabird and Root the local associate. When it's all done, it should look something like this. 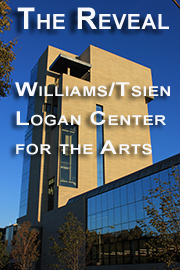 You can find a lot more information about the project, including a video of Tsien and Williams discussing their design, and a live webcam, at the U of C's Logan Center website, here. 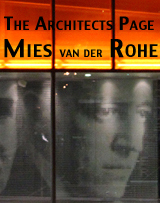 Okay, you've had almost a year - it opened last June - so if you miss the best architectural exhibition I've seen in ages, you've got no one to blame but yourself. One final warning: The extraordinary Louis Sullivan's Idea, at the Chicago Cultural Center, closes Tuesday, May 2nd. An inspired collaboration between City of Chicago Cultural Historian Tim Samuelson and graphic artist Chris Ware, it offers an eloquent selection of artifacts and photographs, a strong and convincing viewpoint, and a compelling story. Ware makes full use of the double-height galleries with large photographs that give you a clear idea of Sullivan's work both in scale and detail. 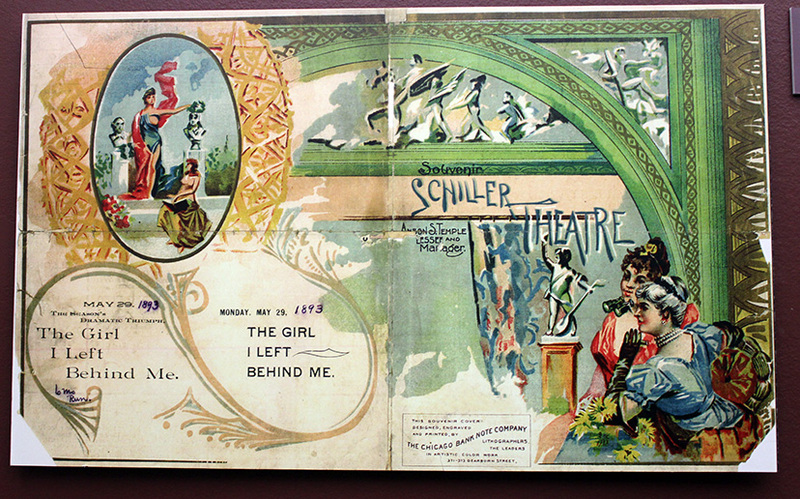 And the story Tim Samuelson recounts is a true epic, from the dismissal of the early work of Sullivan and his Jewish partner Dankmar Adler by Chicago's first architect, John Van Osdel as "architecture run crazy. It's an experiment in Jewishness like we have never seen before," to the crucial influence on Sullivan of the free-thinking, now almost forgotten John Edelmann, foreman of William LeBaron Jenney's office when Sullivan came to work there, who "regarded human beings as inseparable, integral parts of the natural order," and whose image was captured by Sullivan in the sketch you see above. 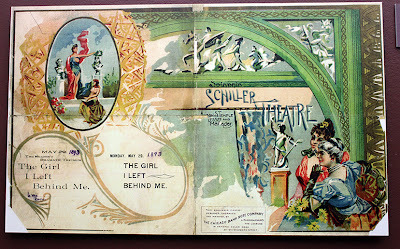 It carries Sullivan through to his greatest triumphs, and to his troubled final years, when his indomitable spirit carried him through abject poverty and rapidly declining health to produce his last two gifts to architecture, the books The Autobiography of an Idea, and A System of Architectural Ornament. 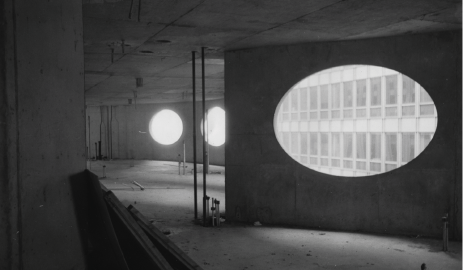 This fall there will be the highly anticipated exhibition of the work of Bertrand Goldberg at the Art Institute, and it has its worked cut for it in meeting the raised bar that Louis Sullivan's Idea presents. 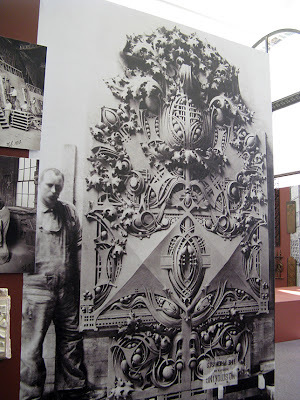 You can see more images of the exhibition and my original report, including a video of Tim Samuelson talking about the show here, but really, Louis Sullivan's Idea is like a great building; it's not meant to be read about, but to be seen and experienced. 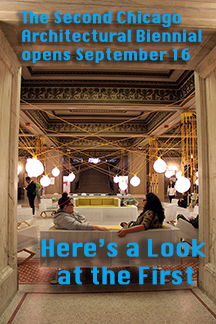 Between now and May 2nd, the Chicago Cultural Center, 77 E. Randolph, is open every day of the week, Monday through Thursday 8 a.m. to 7 p.m, Friday, 8 a.m. to 6 p.m., Saturday 9 a.m. to 6; and Sunday 10 a.m. to 6 p.m. Enter on Randolph, walk up the staircase winding around the outdoor garden, go through the doors on the 2nd floor landing and turn to your right, and enter into the life and thought of one of history's greatest architects. And yes, you actually get awarded for your procrastination, starting Monday, April 25th, construction engineer, historian and story-teller par excellance Sam Guard will be offering special three-hour tours (no cracks about the SS Minnow, please) that begin at the Cultural Center and then spill into the streets of Chicago to encounter the real thing, Adler & Sullivan's Carson Pirie Scott store, the Gage building and ending up at the Auditorium. Guard is scheduling the tours, all beginning at 1:00 p.m., for Monday 4/25, Wednesday 4/27, Friday, 4/29, Saturday 4/30, and Sunday, 5/1. "These are free of charge, only your full attention is required." Space, however, is limited, so rsvp to Mr. Guard via email (samguard@sbcglobal.net) to reserve your place. 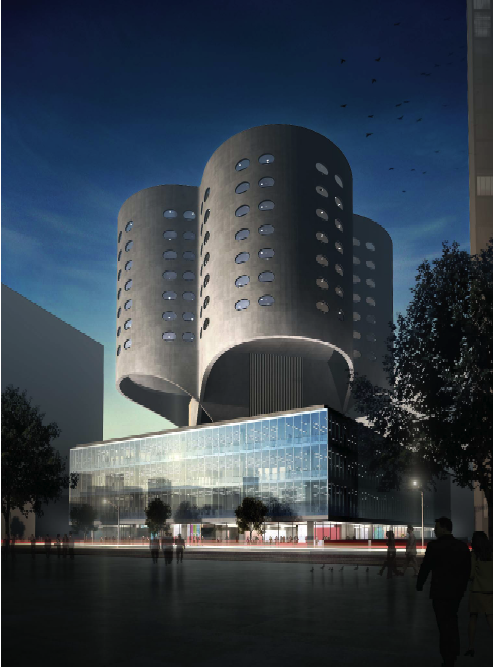 Northwestern University is hell-bent on destroying an essential piece of Chicago architecture, Bertrand Goldberg's Prentice Hospital, saying they've investigated re-use options and determined that there is no other choice. Bunk. The Chicago Tribune editorial board may have swallowed those empty claims whole, but most Chicagoan's are not so gullible. Now, Landmarks Illinois has now called Northwestern's bluff with a stunning report, A New Use for a Modern Landmark: A Reuse Study for the Former Prentice Women's Hospital. 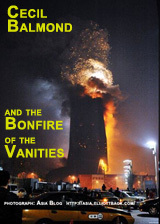 It's a great and compelling read, and you can - and should - download it here. 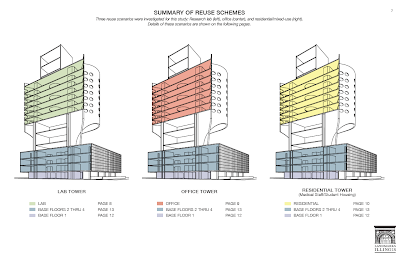 It's a fact-packed, eloquently illustrated and thoroughly researched study of the structure, beginning with a list of testimonials on the building's importance from everyone from Helmut Jahn, Jeanne Gang, and Blair Kamin, to The New Yorker's architecture critic Paul Goldberger. 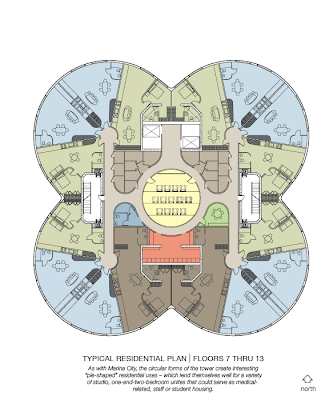 The building includes 340,000 square-feet of space, with 17,000 square feet of open plan space on each of the seven floors in the iconic cloverleaf tower. That open plan makes the building especially suitable for re-use, and the report comes up with three possibilities, as a Research Lab Tower that could accommodate over 800 researchers, an office tower accommodating up to 2,000 workers in the kind of "open office" plan that's becoming increasingly prevalent in workplace design, or as a residential tower with over 100 residences for medical staff or student housing. That third option was actually presented a while back by Northwestern PhD student "Nick" in a comment to one of my earlier posts on the battle of save Prentice . 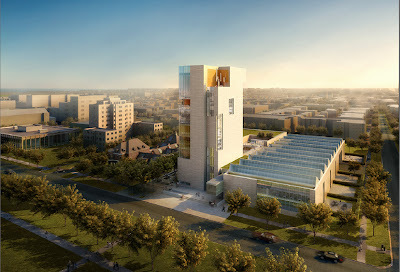 . .
Prentice is situated right in the middle of the medical, business, and law schools (directly connected via tunnel or bridge to the medical campus) and would be an ideal location. We also desperately need a student union and community space to promote interaction, which is currently non-existent within and between programs. I would be very surprised if Prentice would require extensive work to convert into a welcoming, functional student center, which would have the added bonus of keeping with Goldberg's original spirit and vision. Landmarks Illinois reports that reusing Prentice would be, on average, over 40% cheaper than recreating the space in a replacement structure. Just as importantly, it would prevent the creation of another 23,700 tons of construction waste, one of the primary contributors to the nation's landfills. 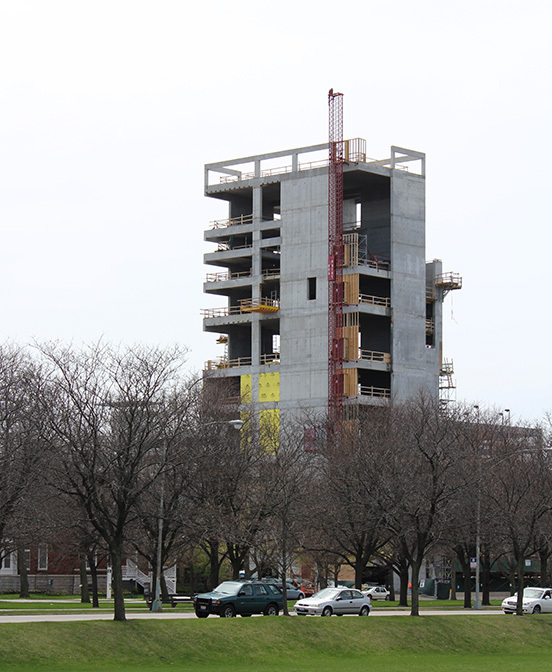 As has been proven time and again, the greenist building is usually the one that's already built. You can debate the particulars of the Landmarks Illinois report, but it makes the primary message crystal clear: Northwestern's claims that Prentice Hospital is some sort of unsalvageable white elephant are without foundation. Not only is Prentice Hospital a central and irreplaceable part of Chicago's architectural legacy, Bertrand Goldberg designed it such a way that it can remain a valuable, productive piece of real estate for many decades to come. Download this eye-opening report here. 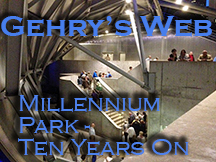 Yes, it's April 22nd, and no, we're still not done adding to April calendar of Chicago Architectural events. This coming Monday, April 25th, at 6:00 p.m., the indomitable Stanley Tigerman will be presenting Displacement, a lecture sponsored by SAIC AIDO at Fullerton Hall of the Art Institute. That same evening, same time, Spanish architect Antón García-Abril will be lecturing at the Instituto Cervantes. 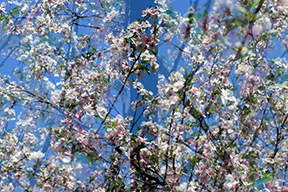 And on Saturday, April 30th, Florian Hecker will be offering the U.S. premiere of his work Speculative Solution at the Graham Foundation, which this Tuesday, the 26th will be screening a program of short films, a preview of May's Architecture and Design Film Festival. 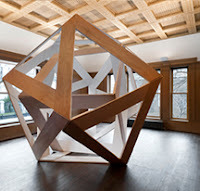 On Thursday, the 28th, Susan Rawles talks about the Worsham-Rockefeller Bedroom at the Driehaus Museum, while on Friday, SEOAI tackles the Seismic Design of Bridges. There are still over a dozen great events to come on the April calendar. Check them all out here. It's not on the calendar, because unless you've received an invitation, well, you're just not invited, but there's also the National Mayors Summit on City Design, which opens on Thursday and culminates in a Friday luncheon event The Design Legacy of Richard M. Daley, in which mayors all across the country will indulge themselves in one last opportunity to salivate over "The Mayor's Mayor", for possessing what few of them will ever have - almost unlimited power for over two decades. The event will include "Remarks of Appreciation of Mayor Daley" (sounds just like a City Council meeting!) and the presentation of the Joseph P. Riley, Jr. Award for Leadership in Urban Design to our departing patriarch. That event, as well as much of the conference, is scheduled to be webcast, including a Thursday morning keynote by Thom Mayne, Culture Now: The Contemporary American Condition, and a lunchtime session, How Design Has Shaped Chicago, with Lee Bey, Gerald Adelmann, and Barbara Gaines. I have to be honest that I'm still not quite clear on how you access the webcasts, but the event press release suggests we "join in the Twitter conversation at #MICD50 and watch the daily mini interviews with mayors at www.usmayors.org." Maybe some information will turn up there. It was originally supposed to be finished by 1998 at a cost of $15 million. By 2005, the estimate was up to $29 million with work still not started - construction didn't actually begin until early 2008. It's made a mess of the major intersection of Grand and State ever since. The cost is now up to $67 million and it's slated to be finished by the end of the year, but I wouldn't bet good money on it. 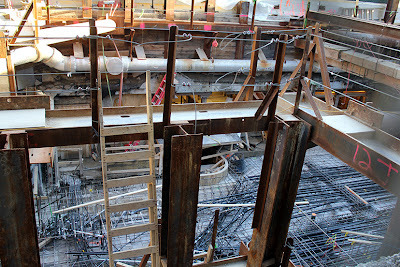 Yes, it's the CTA's Grand stop on the Red Line, and as you can see from the photo above, there's still a lot of work to be done amidst the subterranean complex of mains, conduit, and ancient Roman catacombs. 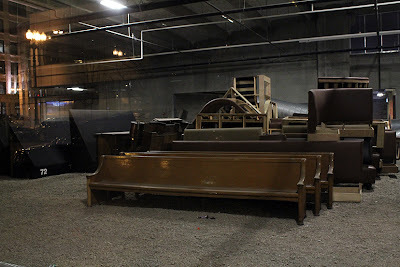 In addition to the glacial work on the revamped mezzanine, which will be expanded an additional 2,000 square feet, the re tiling and vaulting of the platforms is lasting longer than it took Michelangelo to paint the Sistine Chapel, with commuters waiting for their trains amidst bare walls, plywood on the floor, and a lighting system of electrician's lamps, year after year. It looked like this in June of 2009 . . .
and remained uncompleted sixteen months later, in October of 2010 . . .
As you can see from the new sections on display in the photo above, the reconstructed design, as it slowly unveils itself, is quite attractive, and the mezzanine should eventually look something like this . . . The station originally opened in October 1943 as part of the new Howard subway line. 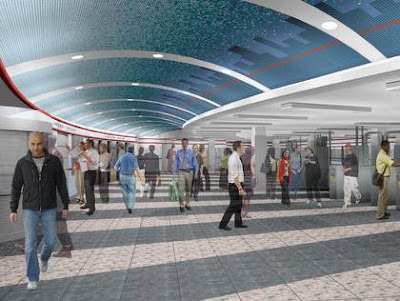 At the heart of the revitalized River North, Grand is now the 8th busiest station on the Red Line, with a daily load of 8,000 passengers. 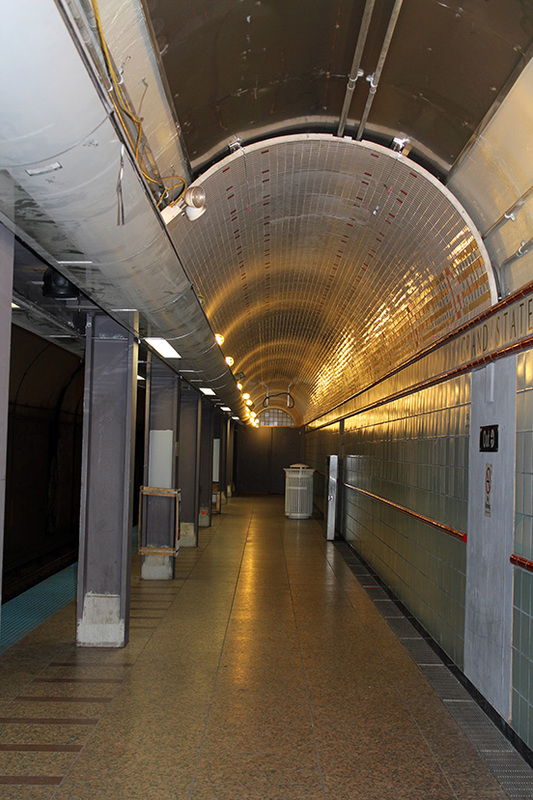 If the reconstructed station lasts as long as the original, it will cost about 34 cents for every passenger passing through its turnstiles over the next 68 years. It could be worse. 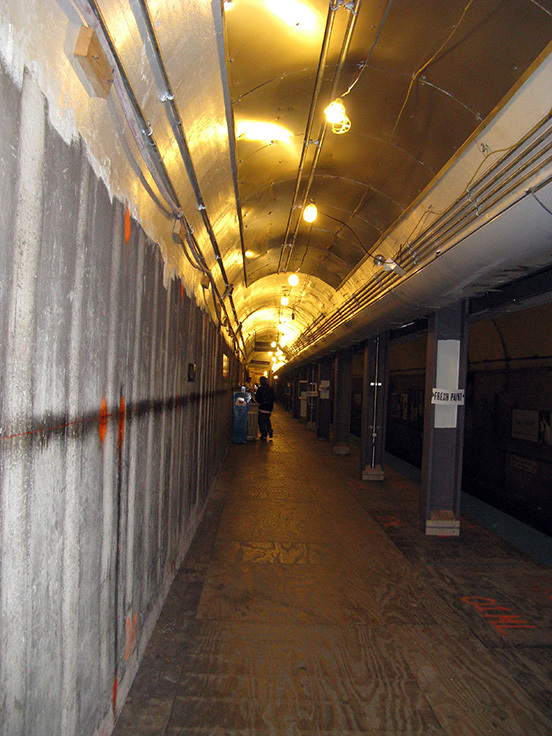 The Red Line's Washington stop closed in 2006 for construction of a new "superstation" under Block 37. Two years later, with no end in sight to escalating cost overruns, the city shut the project down, a money pit consigned to mothballs. Five years after it was "temporarily" shut down, and now mutilated to integrate with the unicorn superstation, the Washington stop remains closed. $300 million dollars of your tax dollars down the tube, with nothing to show for it. Makes the Grand station's $67 million price tag look like a bargain, doesn't it? 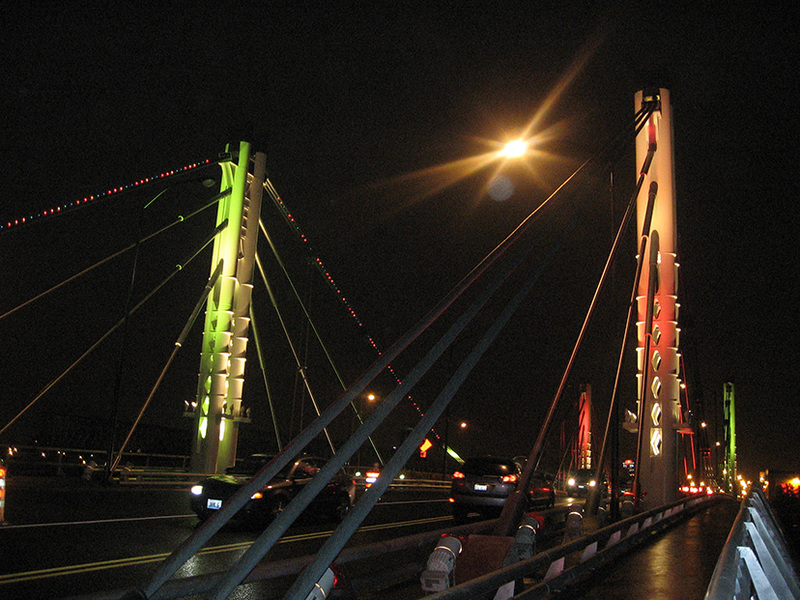 Since 1928, the National Steel Bridge Alliance Prize Bridge Competition has honored more than 300 United States bridges (yeah, I know, that's the third time we've used the word "bridge" - no, four times - in a single sentence) for excellence in design. 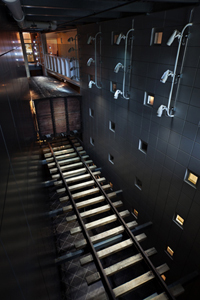 This year, the Alliance, the bridge division of the American Institute of Steel Construction, is promising "the most exciting steel bridge competition in history," a selection of all-time greats from a roster of past winners, with both Industry and People's Choice awards. So, you the People's have through the end of April to pick your favorites. You can find the on-line ballot form here. Illinois is represented by 16 choices. Indiana has none. (Take that!) Kansas has one, in Leavenworth, also known as "the bridge no one really wants to cross unless its outbound". 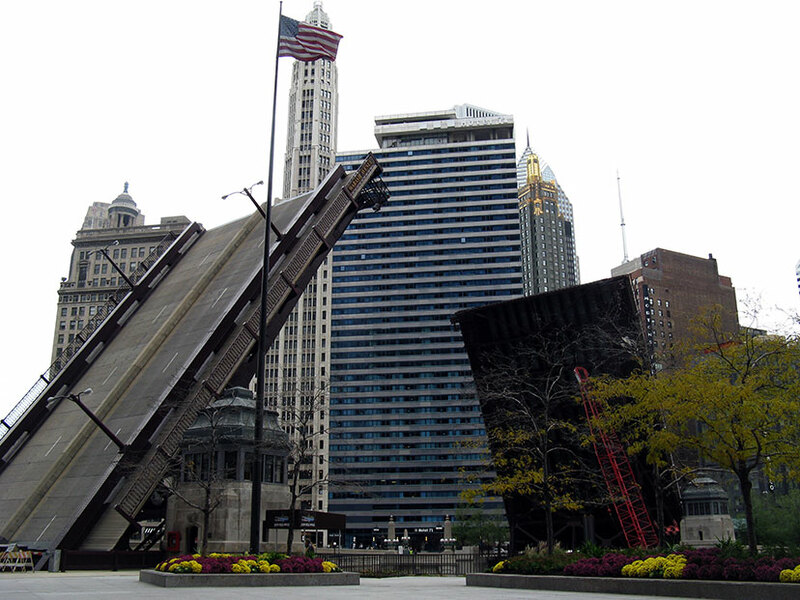 Chicago nominees include the Wabash Avenue bridge, completed in September of 1930 for a mere $1,750,000. Skip forward a half a century and there's the Columbus Drive bridge. Flat and plain, it looks a little underwhelming today, but when it was completed in 1984, it was one of the largest movable bridges in the world - seven lanes of traffic, two 10-foot sidewalks, 270 feet between pivot points, with each of its twin spans weighing 6.3 million pounds, not counting the guy walking across with that really humongous Great Dane. Of course, the nominees aren't limited to Chicago. 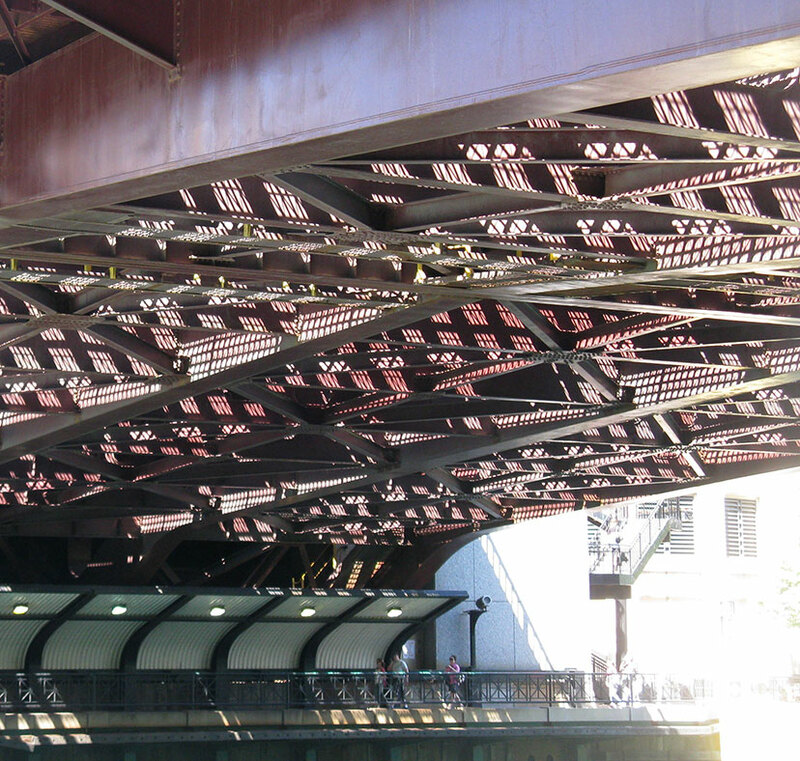 There's also 1933's graceful Cedar Street Bridge in Peoria . 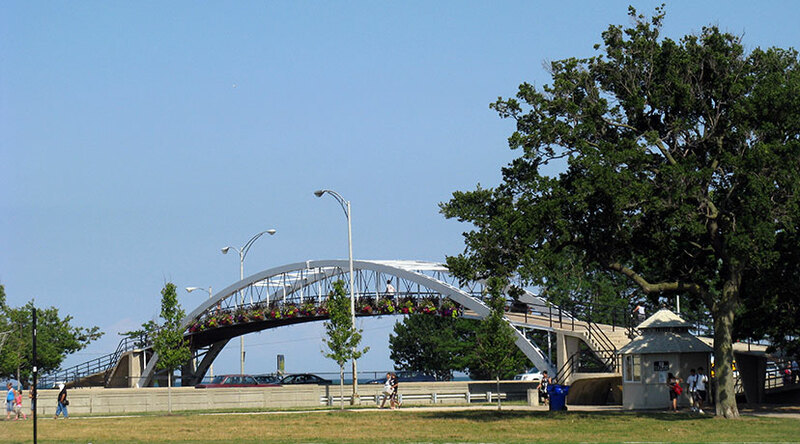 . .
Two of my favorite steel bridges, which didn't make the cut, are both on North Avenue (kind of), both the old classic in Lincoln Park (and what other city can claim they have dozens of bridges on LSD?) . . .
and a much newer addition over the river . . . The good news is that, due to date and technique of construction, such icons as the Brooklyn Bridge are not even in the running. The bad news, the Zakim Bunker Hill Bridge and Golden Gate are. But don't let that discourage you. This is a contest where ballot stuffing is not only not frowned upon, it's encouraged. You can vote for as many of the nominees as you like, as many times as you want. It's like a classic Chicago election - but legal! Vote early and vote often, here. We've just learned that Saturday was the last day for indefatigable correspondent Bob Johnson at this firm of many years. In addition to the innumerable great photo's he's provided to this blog, Bob's engineering skill has gone into the construction of some of Chicago's most prominent towers, not to mention his great work on behalf of the Structural Engineers Association of Illinois. His energetic advocacy has helped expose thousands of Chicago area students to wonders and challenges of engineering, and encouraged them to exercise their own knowledge and creativity in the cause of urban design, through such endeavors as the excellent Future City competition, and this past February's Explore Engineering Day at CAF during National Engineering Week. Bob tells me he will taking a few weeks off (hopefully the weather will soon actually start to resemble Spring), deliver some lectures, and take up some of the many invitations he's received to become involved in various STEM (Science, Technology, Engineering and Mathematics) Education initiatives, which were a major focus of Barack Obama's State of the Union speech earlier this year. Just about everyone talks about the central importance of getting more young Americans educated and involved in these fields. For decades, Bob has been doing something about it. He says he's not actively looking for another full-time gig right now, but he's still available for consulting, and if you need to get ahold of him, let me know and I'll pass it on. Just reading all the things Bob is involved in leaves me exhausted, so I think it's only appropriate to illustrate this post with one of Bob's shots of a beautiful sunrise over the Chicago river. 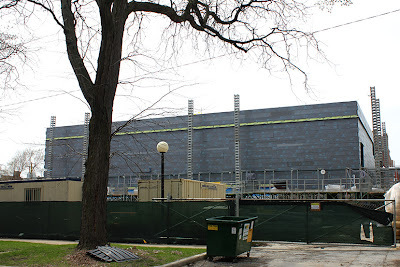 Ok, so it's a taken us a third of the month to get the April Calendar of Chicago Architectural Events up on the web, but here's the strange thing: from today, Tuesday the 12th, through the end of the month, there's FIFTY great events still to come. It kicks off tonight at the Cactus Bar and Grill where the Chicago Architecture Foundation offers up the second of its Chicago Debates: Chicago Public Transit: On Track or Derailed, with a blue chip panel featuring Aaron Renn, Chris Robling, Stephen Schlickman, and Mary Wisniewski, with Edward Lifson moderating. 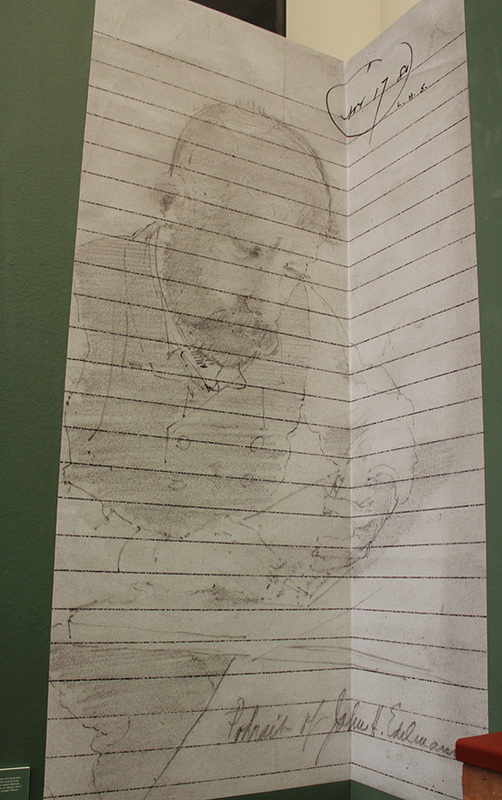 Meanwhile over at MCA, Alex Lehnerer will discuss his work during an informal gallery talk at the Lehnerer installment of the museum's UBS 12 x 12: New Artists/New Work Exhibition. This coming Saturday afternoon, April 16th, there'll be a special all-ages version of PechaKucha at Martyr's on Lincoln, Inspire Japan, to benefit Architecture for Humanity's work in that country. Presenters will include Crandon Gustafson (who is actually doing relief work in Japan), Cathy Ivcich (who will be presenting live Ikebana with colleagues on the PK stage), Photographer Doug Fogelson will show pictures of cherry blossom, Shawna Martell (tales of extreme coupon-ing), Jeweler Carol Blumenthal, Doug Burgett (with some anecdotes of misunderstood artistic endeavors), Laura Bowe from Architecture For Humanity/Chicago, plus other players to be named later. On Sunday afternoon, the 17th, historian Martin Hackl will lecture on The Life and Work of Prairie School Architect John Van Bergen, the first of a series of talks being presented in conjunction with an exhibition of the architect's work at the Barrington Area Historical Society. 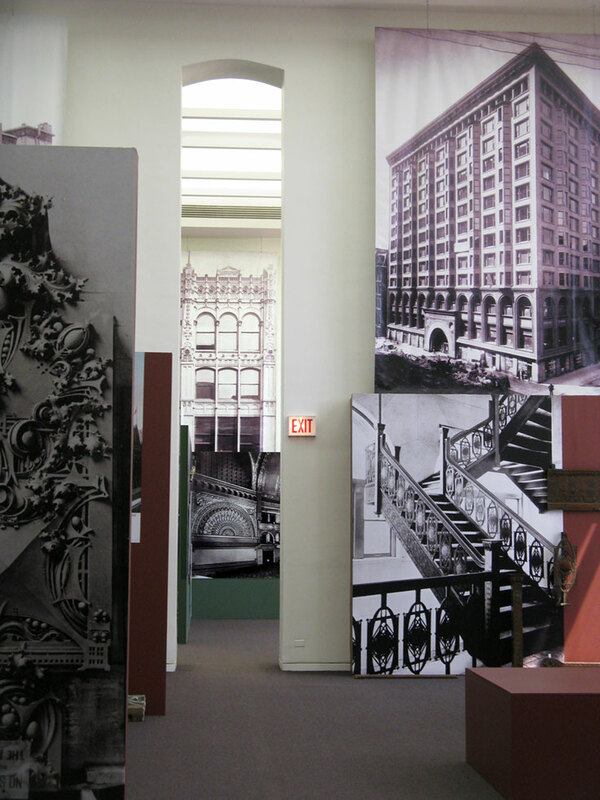 In between on Wednesday the 13th, architects R Thomas Hille and Christopher Lee will present separate lectures at IIT, while Paula Lupkin will discuss Chicago, New York, and the Invention of the YMCA Building lunchtime at CAF. 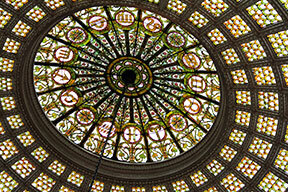 On Thursday, the 14th, Chris Botti discusses the restoration of the Chicago Cultural Center's Preston Bradley Hall Tiffany dome for AIA Chicago, while on Friday, the 15th, there'll be an opening reception for the new exhibition at the Graham, Anne Tyng: Inhabitating Geometry. And that's only some of the events just this week. Later in the month, we've got Young of Architects of Chicago showing their stuff at the Instituto Cervantes on the 19th, where Spanish architect Antón García-Abril will also lecture on the 25th. Other highlights? 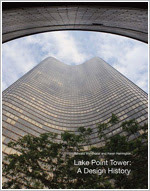 Julian de Smedt at UIC on the 20th, the SEAOI's annual Midwest Bridge Symposium on the 21st, the same day Kevin Harrington discusses Lake Point Tower for Landmarks Illinois lunchtime at the Chicago Cultural Center. Well, you get the idea. There's half a hundred great events still to come this month. Check out the entire April calendar here.